Also known as "Diamond in the Square" this visually appealing quilt, measuring 78" square, is typical of the Pennsylvania Amish. 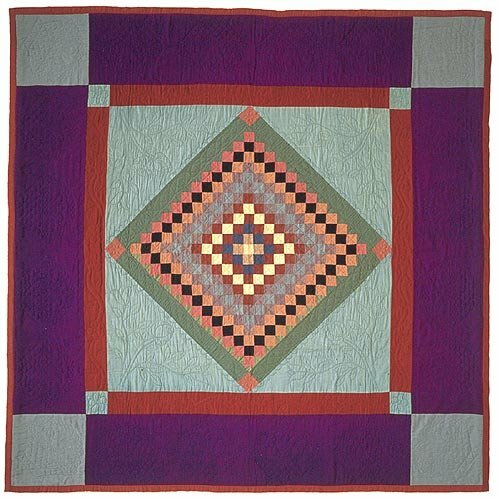 The bold diamond in the center contrasts beautifully with the large, plain borders which offer the opportunity to show off the gorgeous Amish quilting designs. A lovely quilt pieced in either traditional Amish colors - or ANY fabrics of your choice! The pattern includes color and cutting charts to ease in construction, along with both hand and machine piecing instructions. Most exciting of all is the inclusion of ALL the plastic quilting stencils (scroll down to see) that have been designed directly from the antique quilt.